“Diamond is Forever” $10,000 Martini Served Up Just in Time for Valentine’s Day on Florida's Historic Coast. St. Augustine on Florida's Historic Coast is known as one of the most romantic small towns in the U.S. and the Hilton St. Augustine Historic is taking passion in this city to a whole new level with its $10,000 Diamond Martini. “Guests who book at our hotel can request a reservation for the Diamond Martini experience,” said Mark J. Selasky, vice president of sales and marketing at Jalaram Hotels. Guests of the Hilton St. Augustine Historic on Florida's Historic Coast are treated to spectacular views of the Nation’s Oldest City while enjoying a high end cocktail that sparkles with diamonds in the hotel’s Avilés restaurant. 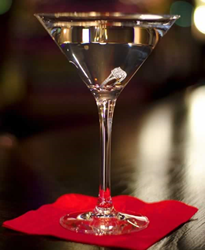 The Diamond Martini is specially prepared by the hotel’s mixologist with the finest Gin or Vodka and will be served with a pre-selected one karat (plus) diamond ring, earrings or other bling. The unexpected luxurious cocktail is perfect for celebrating anniversaries, wedding proposals or other special occasions on Florida's Historic Coast. The $10,000 Diamond Martini is a reflection of the new million dollar interior renovation featuring custom designed furnishings and refreshed Spanish Mediterranean décor in this St. Augustine hotel. To request a reservation, including an appointment with a local jeweler on Florida's Historic Coast, contact Beth Vanderberg or Jeffrey Oliasami at 904-829-2277. A 72 hour advance reservation is required. The Hilton St. Augustine Historic Bayfront, one of the many quality lodging options on Florida's Historic Coast is located at 32 Avenida Menendez, St. Augustine, Fla. The 19 buildings of Hilton St. Augustine Historic Bayfront, inspired by the St. Augustine's Second Spanish Colonial period, showcases Matanza Bay views. The hotel is close enough to walk to Castillo de San Marcos National Monument, the Colonial Quarter and the Fountain of Youth. The beach is only 3 miles away. For more romantic getaway to St. Augustine and Florida's Historic Coast Visit http://www.FloridasHistoricCoast.com. Located midway between Daytona Beach and Jacksonville, Florida's Historic Coast includes historic St. Augustine, the outstanding golf and seaside elegance of Ponte Vedra, and 42 miles of pristine Atlantic beaches. For more information on events, activities, holiday getaway and vacation opportunities in St. Augustine, Ponte Vedra & The Beaches, go to the Visitors and Convention Bureau website at http://www.FloridasHistoricCoast.com, become a fan on Facebook (Facebook.com/OfficialStAugustine) or call 1.800.653.2489.